Have I Crossed Some Sort of Line? This bike is on my local CL. Condition looks pretty good, it's 7-spd indexed 105, and looks original save for the wheelset (which is comparable to the original 105). Seller is asking $150, which is legit for a bike of this level in Cromor, it's my size and I like the color, and I have the money. So I should clearly dash out and bring it home. I can't get past this seat stay joint. It looks clunky and sloppily done, almost like it was cut too short and somebody quietly decided to "just make it work." Have I crossed some invisible line where aesthetic judgments are going to interfere with otherwise healthy N+1 behavior? Am I correct that this reeks of half-assed craftsmanship, or am I being overly judgmental? Maybe I've just reached some new, perfectly natural plateau in my cycle-acquisition requirements. I dunno. You tell me. Looks H-A'd to me as well. When I acquire bikes to keep, I look for something different/better/more interesting than what I already have. If not, it needs to be flip fodder (super deal), or I will pass. $150 is a good deal, but not a super deal. I likely would not have spotted that until too late. Having pointed it out, its likely I would pass on something like this. I like to think I can trust the frame. I likely would not have spotted that until too late. If he hadn't posted that close-up pic I probably wouldn't have noticed until it was in my living room, so I'm with you there. Buy it first. You can sell it later if you don't want the bike. I think your at the point where you start searching out what it is that you want. You have to find the bikes and not let the sellers with lesser quality goods find you. It's like I once told My brother "you can date a nice pretty girl just as easy easily as you can date a mean ugly one, the key is that YOU HAVE TO CHOOSE WHAT IT IS THAT YOU WANT!" Can you find a photo of another Miele bicycle with that seat stay? 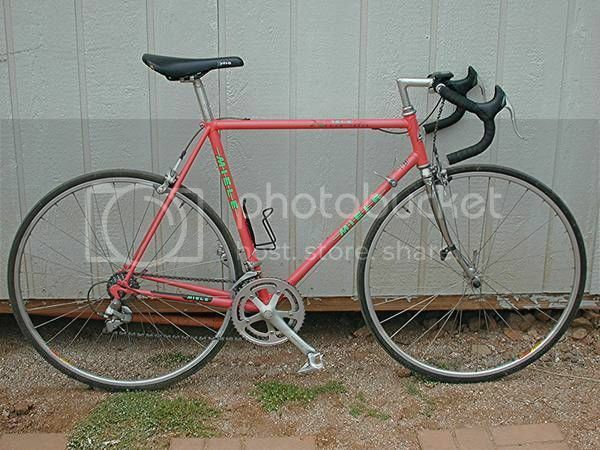 Are there any other identifying marks on that bike that would say that it is 100% authentic Miele? It looks like the brand had quite a bit of variability. That looks like some generic Japanese seat stay, but I'm having troubles placing it. Ahhh... Maybe this Miele Binova???? Anyway, try to verify the authenticity before taking the plunge. Indexed 105, down tube shifters, and it's orange? I'd jump on it. My first 2 (keeper) mixte's have derailleur hangers built in - not the "claw" type. Now I'm looking for another mixte and I see many on my local CL, however if they have "the claw" I don't consider them. I feel like it would be going backwards. But this phase may pass. ...maybe they were saving weight. Last edited by Fahrenheit531; 03-26-15 at 12:54 AM. First question: are you an engineer? If so it will bug you for ever and you'll not be happy. You may even obsess. If you're not an engineer (lucky guy), maybe you could adjust and live with it, even overlook it. As and engineer, I'd pass. Quirky, huh? It's the same with any "collection", you start out seeking "quantity" and as time goes by you begin to seek "quality". I find myself in the same position, bikes I would have been excited about 2 years ago I don't even give a second look unless they're too cheap to pass up for parts or trading material. My "fleet" is still fairly low end by most standards but it is slowly moving up the ladder. As my Mother (Masters in Shakespeare from Columbia) would say, "Ed, his English ain't so good, you sure he's not an engineer?" As for me, I'd pass it if I could, however, depending, of course, on who was riding it at that moment in time, I might just hang along for a chat. Just think "Paramount," and clarity will immediately come to you. I have had a couple of Miele Lupa's pass through...and, looking at their pictures, they have the same look. While not the most attractive, it is functional. 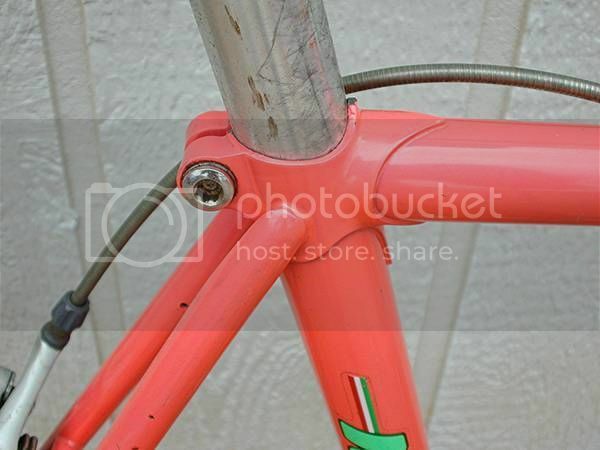 Also...if you are willing to do the parting out thing on a frame like this, I paid about the same for both Lupa's...and made a decent profit...but...again, I lean to the parting out portion...so, you make more that way with a bit more work. Being an engineer, it would certainly bug me. I wouldn't buy it for the sake of my future sanity, to preserve the little that I have left. Of course, the "bike with babe" factor! You could just tie a bandana around the seat post and it would no longer bother you. Simple fix. Sorry....I just don't know what's wrong with it. Looks fine to me. Doesn't mean you shouldn't get the bike, just that it's worth less to you. Decent gruppo, nice looking wheels from what I can see in the pic. That's $100+ worth of stuff and few things beat the warm cozy feeling of plenty of extra parts for your next build. Engineers, Paramounts, bandana cover-ups and other hilarity... I love this place! Slept on it and I'm pretty sure that, as Prowler described, it would be the first thing I looked at every time I saw the bike. And not in a good way. Damn shame, really. Until I noticed that I was pretty excited about finding room for it in the stable. BWAAAAA HAHAHAHA watch the Lawrence Welk version that shows up in the "related videos" to the right!